Music streaming apps suited for you. Either on the web or in your hands, 8Tracks and Songza are two free music apps that are great for people who are on-the-go, working in office or just want to switch it up from their iPods. For any mood to activity like getting ready to go out or crying yourself to sleep Songza & 8Tracks have you covered. Songza has a slick design and easy navigation to find mainstream playlists whereas 8Tracks is all about discovering artists you’ve never heard of. Let’s start with Songza. Music experts create various playlists based on time of day and mood or activity. Users can vote songs up or down, and the service will adapt to the user’s personal music preferences. Users can find playlists not just based on artists, songs, or genres, but also based on themes, interests, and eras. You can create playlists with little creative control, so its best to just stick to the playlists created by the music experts. For 8Tracks, anyone can be a DJ. This gives the user full control and creativity to add titles, images, descriptions, at least 2 tags, and at least 8 tracks when creating a playlist. They also have the option to mark mixes as unlisted, which makes them private. When a DJ uploads songs to the site, they appear in a list next to where the mix is created. Each DJ has a profile which can be accessed by clicking on their name or avatar. This page displays the user’s basic information such as their location, a short bio that they can add, their Twitter handle, or any other website related to them that they would like to have featured. Every time a DJ is followed their mixes are displayed on your feed in reverse chronological order. Right away, the major difference between these two is that Songza has “music experts” whereas 8Tracks is all about the “regular” user creating playlists. Songza is for sure more polished and sophisticated while 8Tracks has the more indie, lay-back feel. Both approaches have their advantages – however, as of recent, I’ve been listening to a lot more underground remixes that are usually featured on Soundcloud which Songza legally cannot use on their site. So the nice thing about 8Tracks is that you can find a lot more songs that have been remixed/covered/remastered by an underground DJ or artist that you’ve never heard of on the radio. This leaves Songza having the more “iTunes-official” songs, which no doubt is more professional and ideal for the work-based environment. The user customization of the playlists in 8Tracks means more potential for creativity in the choice of which songs are included in a given playlist, leading to discovering new songs that you’ve never heard of. Essentially, both 8Tracks and Songza are actively pleasing the listener. It comes down to it being easier to find a good playlist quickly on Songza, and it being more likely to find something less mainstream on 8Tracks. Overall, Songza is ideal for the office setting or if you’re hosting a cocktail party whereas 8Tracks is worth trying out if you’re in desperate need of new music and want to impress your friends with your wide music knowledge. At Marwick Marketing, we have office-based playlists suited to get you through the week. Check them out here! 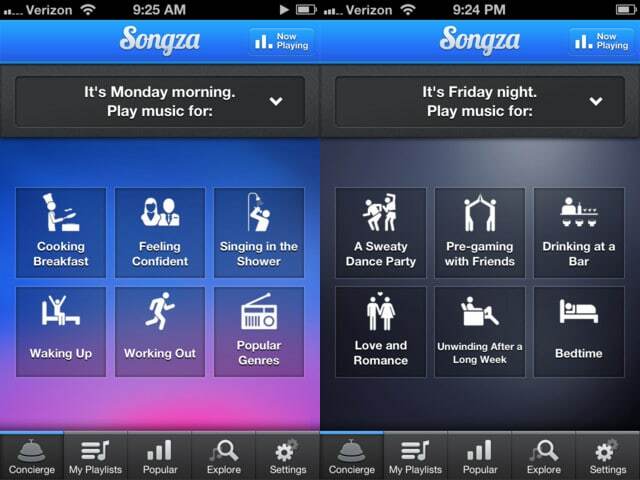 You can download both Songza & 8Tracks on your smart phone or stream it on the web for free.